Overall, the battery life on the M700 is good. I wouldn’t brag about it, unless I had the optional slice battery to go with it. I didn’t get the optional slice battery to review, but it gives you all day computing power. I know this because I had some hands-on time with it at CES. Back to the standard 6-cell battery. After testing it out I got about three to three and a half hours in high performance mode. If you want that claimed five hour battery life you will have to set your tablet to the power saver mode. However, in balanced mode I did get four to five hours depending on what I was using the M700 for and that is respectable. 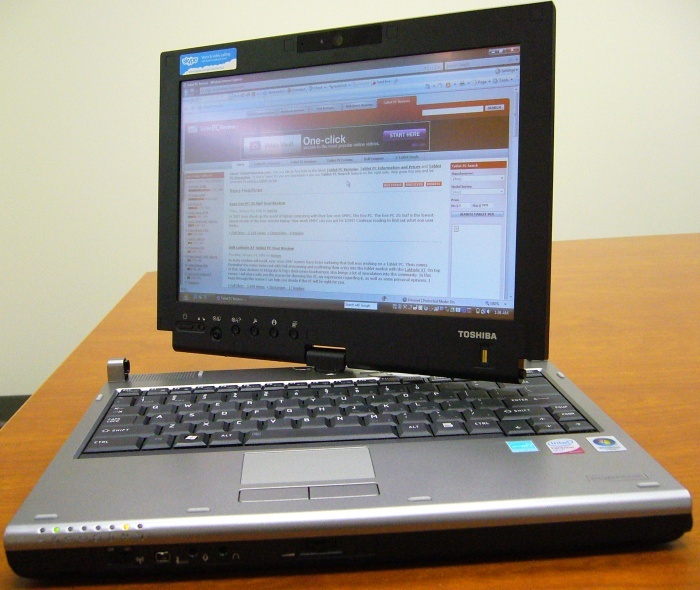 The M700 is a typical tablet. It does have two speakers though, one on each side of the keyboard under the monitor. The sound output is decent, but it doesn’t get very loud. I don’t think the M700 is made to be your iTunes listening machine though. It’s good for voice recognition and the headphone port works fine for tuning out distractions. My iPod actually goes louder then the M700, but that is typical for a business tablet. The speakers do get covered a little when in tablet mode, so the sound gets a little muffled, but you can still hear it. There is a nice volume wheel on the front of the tablet for quick adjustments of the volume, which is a convenient feature. The connectivity on the M700 worked fine. It has 802.11a/g/n and Bluetooth. I didn’t have any problems connecting at home or in the office. It has a strong antenna as well because I could pick up all my neighbors Wi-Fi signals and my Asus R1 does a poor job of that. The M700 I reviewed ran Microsoft Vista Business. I had no problems with it and actually prefer Vista on tablets thanks to the improvements in handwriting recognition and the pen flicks. It did come with tons of bloatware and free trial programs that slowed the notebook down. I would recommend getting rid of the bloatware. There were deals for LoJack and DVD rentals, kind of annoying. The M700 is a solid tablet. You get what you see with it. There isn’t anything fancy, just a minimalistic design with all the necessities. The silver body protects a great LED backlight screen that has both a touchscreen and active digitizer and it doesn’t lack in performance or features. The hinge is definitely an added bonus because it locks the screen in place and gets rid of any wobble. Business professionals and college students should enjoy taking notes and giving presentations with the M700, especially considering it has such an affordable starting price. This entry was posted on August 12, 2008 at 8:43 am	and is filed under Toshiba Portege M700 Tablet PC Review. Tagged: Toshiba Portege M700 Tablet PC Review. You can follow any responses to this entry through the RSS 2.0 feed. You can leave a response, or trackback from your own site.